Thiru Onam is celebrated in the second half of August (the Chingam month of the malayalam calendar ) or first week of september when the monsoon rains come to an end and the autumn season in kerala begins . Social anthropologists see Onam as a great fertility rite, the ceremony of Thanksgiving for a plentiful harvest. For Keralites Onam is the celebration of the return of Mahabali, their once beloved king. 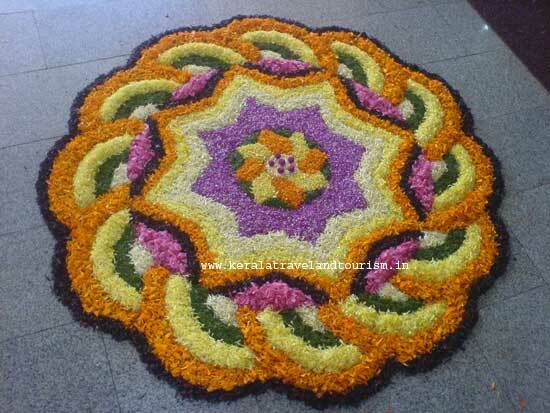 Onam is celebrated over 10 days. onam is a good time for shopping as many shops offer bargain deals. onam sadya: is a vegetarian course of food that is served during the onam festival. Onam also is the season for snake boat races in kerala. 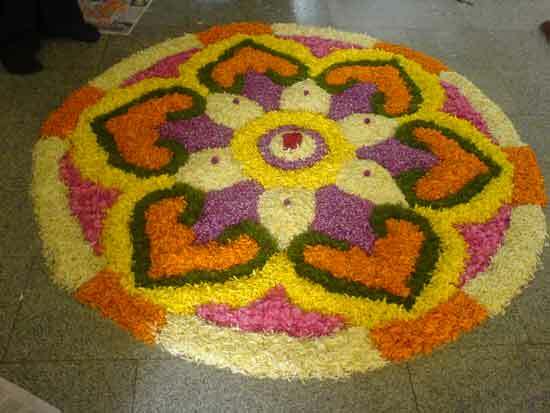 Floral carpet (pookalam) which are made by most people in kerala during the onam days. Uthradam : utrada pachil which signifies the rush to make all the necesary arrangements on the day before onam.